Easter is this Sunday. For some of us, this holiday is a time for introspection, renewal and growth; as a shovel dug deep, tilling the the earth, in preparation for planting seeds. It’s also a time for honoring family traditions with special dishes. The following recipe is my new Easter tradition and I intend to make this every year. You see, my father passed away right before Easter last year, and my next door neighbor, Krystyna Bobowski, brought Polish-Stuffed Easter Eggs over to my family that evening. As we looked at Dad’s photographs, telling stories of his life, we ate these eggs. I recreated a similar recipe for today’s blog. Preparing them elated me; I was celebrating his life. With a sharp knife, tap around central circumference, then firmly whack in half. With a spoon, remove yolks an put in a bowl. With a fork, smash egg yolks and seasonings until smooth. Finely chop 1/2 of egg whites. Fry in butter until golden brown. A recipe as lovely as a daisy chain passed to me from Krystyna, these stuffed eggs are now our new family tradition evoking memories of my father. Krytyna’s mother made them for her in Wloclawik, a town in northern Poland, prior to World War II. So many of us have stories and traditions behind recipes that evoke memories such as this. A cruise through the internet tells me there are as many recipe traditions for using leftover hard-cooked eggs as there are cathedrals in central Europe. 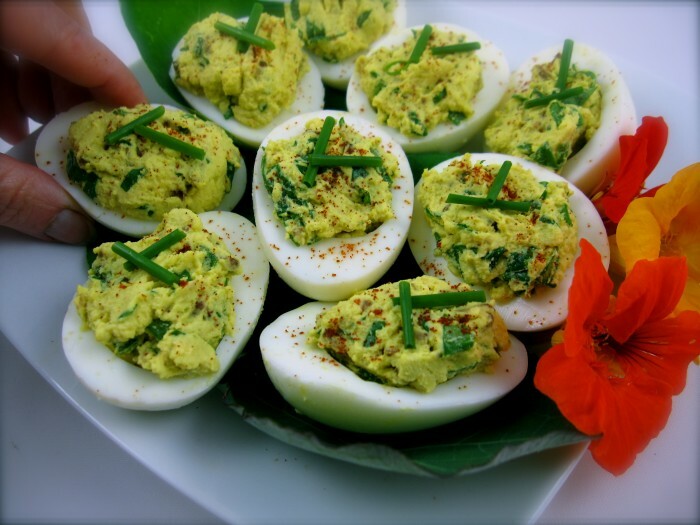 My mother always made Curried Creamed Eggs, and egg salad sandwiches or stuffed eggs, such as Stuffed Eggs Florentine, make good use of leftover Easter eggs. Leftover Easter eggs keep a good week, refrigerated, left in their shells. The dye seeps into the egg white a bit, so advise the bunny to use food safe dye, available at this time of the year with other holiday accoutrements at most groceries in town. Krystyna’s recipe is simpler than the one below. She doesn’t include dill and only uses a small amount of chives. Nor does she include mayonnaise or mustard; only sour cream. I’ve also seen other recipes including chopped Polish ham or cheese. But recipe differences surrounding these stuffed eggs are fine by Krystyna. “Growing up in Poland,” she says, “Every home was doing something different with their eggs.” Happy Easter! With a very sharp knife, firmly tap eggshell horizontally along the center of shell, then cut in half. With a spoon, scoop yolk from halved eggs and place into a medium-sized bowl. Gently scoop out egg whites, and reserve egg shells for stuffing. Finely chop half of remaining egg white and reserve. With a fork, combine egg yolk with mayonnaise, sour cream and mustard, and mash together until smooth. Stir in dill, chives and reserved chopped egg whites. Season to taste with kosher salt and freshly ground pepper. Stuff and flatten mixture into reserved egg shells. Sprinkle panko or bread crumbs over the top and gently press into egg mixture. In a large sauté pan, melt 1 tablespoon butter over medium-low heat. 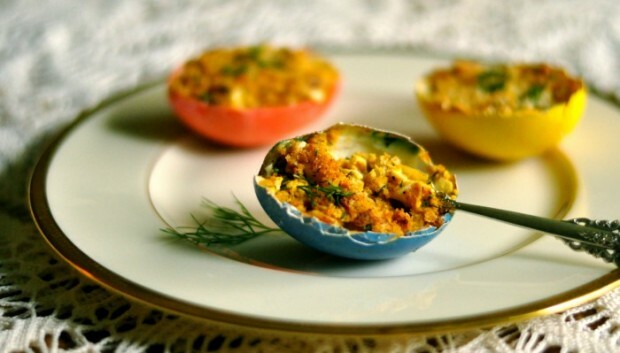 In batches, place eggs, shell side up, in simmering butter and cook until breadcrumbs are golden brown, about 15 minutes depending on heat. Add additional butter to pan when needed. Serve eggs warm, topped with a few sprigs of reserved chopped dill.